Parks and Recreation actor Adam Scott is set to attempt the third Greatest Event in Television History on November 7, at midnight. Only on Adult Swim. Adam Scott has already failed at this twice, first recreating the opening credits of Simon & Simon in 2012 alongside an aloof Jon Hamm, and then taking a second stab at it in June with the Season 4 opening credits of Hart to Hart, working against Parks and Recreation co-star Amy Poehler, who only holds contempt for her NBC love interest. Which opening credit sequence will Adam Scott attempt next? 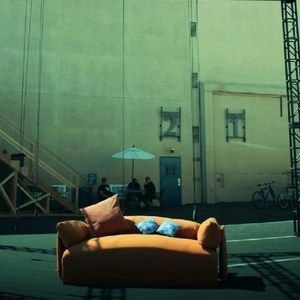 We're only given a hint with this on-set photo...Is that the couch from Too Close for Comfort? We'll have to wait until later this fall to find out if Adam Scott is donning a silver wig to role off the back of it. Let's hope Jm J. Bullock is playing himself!